Very low mileage (2,215 miles) and in immaculate condition. Lightweight 750 Breva with full Hepco and Becker luggage and touring screen. Used for a couple of summers by the original owner and then stored, recently re-commissioned by us. - Showing just 2,215 genuine miles from new ! Excellent, lightweight touring Guzzi, rides as a new bike and is ready to enjoy. Price: £2,995 but be quick !, with six months warranty. Just in, nicely sorted 1000 Le Mans, original factory black and gold colour scheme. UK bike from new. - Paint work: metallic black Guzzi, original paintwork, a number of chips, scratches and marks, not perfect, looks great from a few feet away. but close-up not as good. Mean black and gold Le Mans 1000, rare bike and very sought after in this colour scheme. Stunning restoration of an 850T3, based on what was a 1981 950cc G5 (G5’s and T3’s are in essence the same bike underneath). 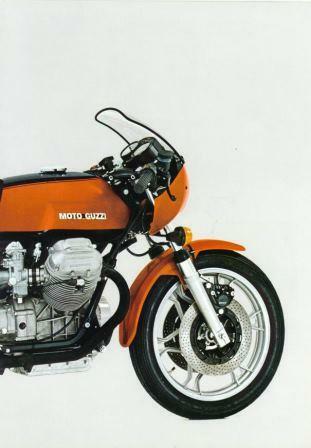 This example is well known in Guzzi circles and subject to a series of press articles. Great opportunity to obtain a spoke wheeled "T3" in mint restored condition, having covered just 4,000 miles since a complete restoration to an incredible high standard. Previously sold by us. Stunning bike, that requires absolutely nothing and a bit of a bargain due to not originally being an 850T3. If you find a better example you should buy it ! Lovely 850 Le Mans 2, that has been converted to an V7/S3 type cafe racer. Newly MOT'd, serviced and ready to enjoy. Cool bike and a genuine 850 Le Mans, with all the right bits and a great style ! Reduced price: £5,995 with six months warranty.